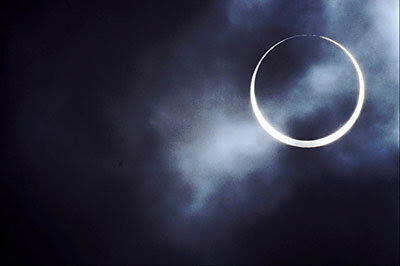 The solar eclipse this Sunday, May 20, is one that has special significance for me - it is on my birthday. For those living in England, this isn't a particularly important eclipse because it won't be visible from any part of the UK. Also, it isn't a total eclipse. It is what is called an annular eclipse, when the moon appears slightly smaller than the sun so doesn't cover it entirely - a ring of light appears to shine around a black sphere. Nevertheless, when I realised there'd be a solar eclipse actually on my birthday in 2012, I felt I ought to do something exceptional to mark the occasion. I checked where the eclipse would be visible from; places including China, Japan, Canada, the USA and Mexico. Wow, I thought, Mexico! I could take a holiday to Mexico and watch the eclipse over the Mayan ruins of Chichén Itzá. That really would be the birthday experience of a lifetime. I had time to plan the holiday. I could do it if I emptied out all my savings and borrowed a bit on plastic. But I'm not going - and that was a conscious decision. Money has been tight ever since I took redundancy last summer and have been trying to make a living from freelance writing. I'm getting paid work, but not enough to afford a second foreign holiday after going to see the Northern Lights this spring. I decided to be sensible. But with the eclipse taking place in just couple of days time, I'm wondering if it was the right decision. Maybe I should have just booked an eclipse tour and paid the bills later. But it doesn't serve any useful purpose to spend time getting depressed over regrets for what might have been. It is better to concentrate on what I'll be doing instead - apart from having a birthday party with my lovely friends in a London pub, that is. Solar eclipses always happen at the time of the new moon, which I have found to be a good time for scrying using a dark mirror or other forms of divination. An eclipse is generally a better time for inner journeying than for travelling somewhere in the real world - unless that somewhere is a good place to watch the eclipse, I guess. This eclipse occurs when the sun is in Gemini, which has to do with communication - words, writing, discussion and, nowadays, the internet. Maybe this eclipse, on my birthday, is a time for me to take a good look at what I really want to do as a writer; and use a birthday wish to make my dreams come true. I have been reading your blog for sometime and it is fast becoming my main portal of news for what is going on in UK witchcraft so thank you very much! I did want to say that whilst I think you have made a good decision not to empty your savings, don't give up on Mexico just yet. I went to Mexico and Chichen Itza for an extended trip about 8 years ago and it was the most magical place! Antara - I certainly intend to go to Mexico one day! nHello, like Antara, I wanted to say I really appreciate your blog - excellent stuff. Regarding the birthday, I'm sure you made the right decision, it's all very well committing to stuff when we're flush, but you'd probably have felt guilty after the event. But, I just Googled 'solar eclipse 2012 live' and there are quite a lot of sites saying they will stream live coverage - so if you decide to watch, you still might see some of it as it happens. Good luck and have a very happy birthday.